The estimated retail value of the home and garden market in the United States has reached around 275 billion U.S. dollars and is expected to grow more in the coming years (Statista). Apart from the above data, many types of research have proved that home and garden market is growing like never before. Thus, it won’t be wrong to state that it can be an excellent industry for businesses to invest in. And, Blue Mail Media can help you do that better. We provide Home and Gardening Email List – a database that will take you to your most potential buyers in the home and gardening industry. 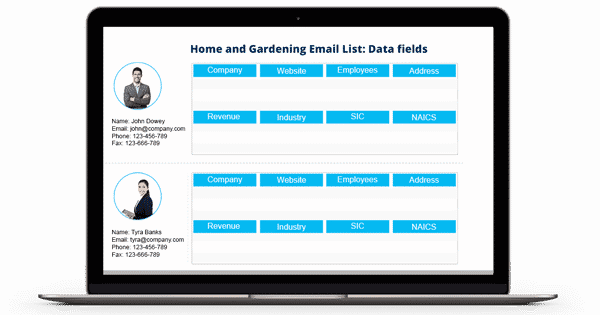 The list is a double-checked and verified email database encapsulating contact details of the professionals related to the home gardening or home remodeling industries. True data refers to the marketing database that is analytical, actionable and thus competitive. With our Home and Gardening Industry List, Blue Mail Media equips you with the same. All the contact records in our Gardeners Home Remodeling Mailing List are highly accurate and verified by using the sources such as company newsletters, seminars, industry exhibitions, conferences, and more. We make sure to power-up your multi-channel marketing campaigns with this actionable data so that you can target your potential buyers and retarget your existing or old customers successfully and efficiently. Availing our Home and Gardening Email Database, you get an edge over marketers as you get the reliable access to reach the decision makers from this industry. You can also get the mailing list customized based on – company name, company employees, company revenue, SIC/NAICS codes, and more.